Make choosing a coffee pod a little more fun and interesting for your family or clients, with Southern Homewares Countertop K Cup Display rack. Instead of digging through a drawer or (even worse) a box, simply display six flavors elegantly and VISUALLY to make a client's experience in your office that much nicer. It’s about hospitality. Also great for a restaurant display. Dimensions: 3 1/2" x 3 3/4" x 10 1/4"
Use your coffee pods to create an attractive and interesting piece to spruce up your office. Instead of hiding away those coffee pods or making your clients fuss around with boxes and drawers, why not display six fine options for them to choose from and give them a nice, flavorful experience? I don’t have to tell you that 'the little touches' easily make your office a more inviting place! This fun little rack is made out of stamped steel for years of service, and comes with an artful ‘steaming coffee cup’ design to top it off. It’s nicely at home in almost any environment including a doctors or dentists office, a corporate breakroom, a diner or restaurant, or even just at home. You don’t just pick through the flavors, you SEE the flavors. A nice touch. Also great as a display rack at church or in your store, letting customers and patrons simply decide their flavor while they wait in line, instead of picking once they get to the machine. Order yours today, and get a simple touch of low-key flair that brings a nice vibe to almost any space. Enjoy! 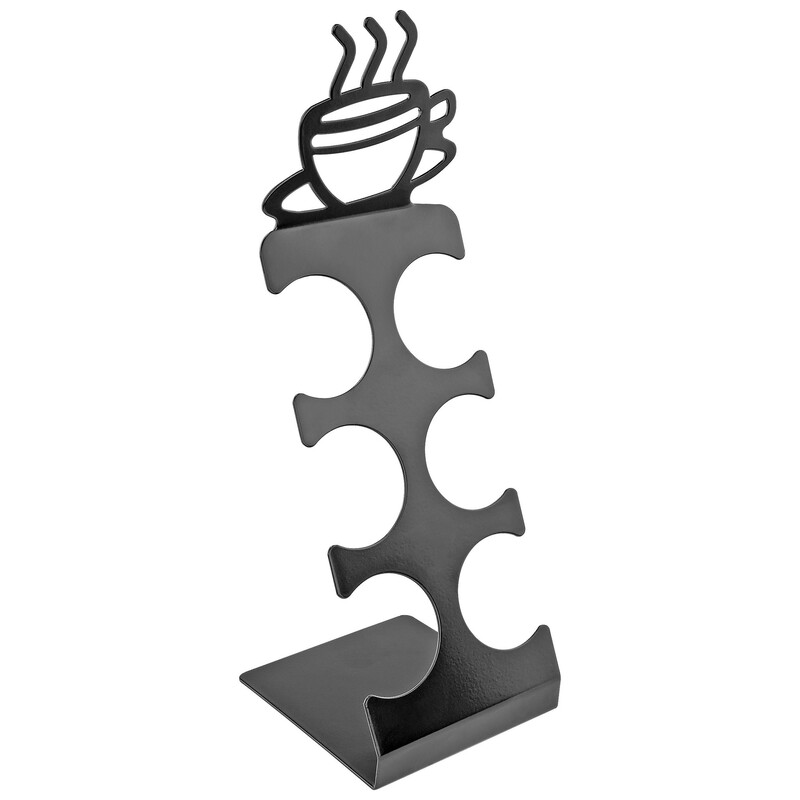 Hold up to 6 of your favorite coffee (K-Cup) pod's in this elegant steel black storage rack. Perfect for any kitchen! Great gift idea for Birthday, Holiday, Christmas, or even your company White Elephant party! Dimensions: 3 1/2" x 3 3/4" x 10 1/4"